GAO generally defers to an agency’s judgment when it comes to the evaluation of proposals. This deference flags, however, when an agency evaluates competing proposals inconsistently; or, in other words, treats offerors disparately. Let’s take a look at how GAO, in a recently sustained protest, found that the agency’s evaluation was unreasonable. In Bristol Environmental Remediation Services, LLC, B-416980 et al. (Jan. 16, 2019), the Army Corps of Engineers solicited environmental remediation and munitions response services. The agency noted that it would evaluate the proposals on a best-value tradeoff basis, with non-price considerations being significantly more important than price. In all, the agency planned to award up to 10 fixed-price IDIQ task-order contracts. After conducting discussions with offerors in the competitive range and obtaining revised proposals, the agency assigned all offerors identical ratings for their non-price factors, with one exception. For the least important non-price factor–which consisted of offerors’ proposing a technical approach for a sample project–the agency assigned identified two weaknesses in Bristol’s proposal and assigned it a marginal rating. (This marginal rating cost Bristol a contract, which the agency awarded to six other offerors.) As you can imagine, Bristol challenged the two assigned weaknesses. Taxpayers have the right to know how the government is spending their money. After all, the insights gained from total transparency in the federal procurement process can hold agencies more accountable. For this reason, administrations and congresses have undertaken initiatives to boost transparency and improve oversight of federal government spending on a bipartisan basis. A few efforts stand out, such as the Clean Contracting Act, USAspending.gov and the DATA Act, but outside of these select few, transparency is still lacking under Federal Acquisition Regulation Part 16 Indefinite Delivery, Indefinite Quantity task or delivery order awards. To fix this, it is time that federal agencies be required to provide post-award debriefings to all unsuccessful offerors, regardless of the value of the awarded IDIQ task or delivery order. When GAO lacks jurisdiction to hear a protest over a task or delivery order, contractors have the right to complain to an ombudsman. Implementation of the ombudsman right, however, has been haphazard at best. Last week, the DoD, GSA, and NASA–the entities comprising the FAR Council–proposed a rule to help alleviate this issue for IDIQ contracts. Generally, 10 U.S.C. § 2304c and 41 U.S.C. § 4106 require each head of an agency that awards MATOC or delivery order contracts to appoint “a senior agency official who is independent of the contracting officer” as the “task and delivery order ombudsman.” The position requires the appointee to review complaints from contractors in order to ensure “that all of the contractors are afforded a fair opportunity to be considered” in certain circumstances where the underlying contract falls outside of GAO’s jurisdiction. The Defense Department plans to issue a single award for a commercial cloud computing contract that some analysts believe could be worth as much as $10 billion over the next 10 years. Pentagon officials released a draft request for proposal last week that coincided with an industry day regarding the Joint Enterprise Defense Infrastructure cloud procurement, an effort that began in September. Companies have until March 21 to submit feedback as they position themselves to compete on what is assuredly an aggressive acquisition timeline. 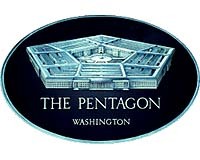 Pentagon officials said they plan to post the final solicitation in May before awarding a single indefinite-delivery, indefinite-quantity contract in September. The General Services Administration added 31 companies to its One Acquisition Solution for Integrated Services contract, increasing the number of small businesses offering professional services like program management, management consulting, logistics and more. The recent addition expands the second pool of OASIS SB contractors from nine to 40 companies, ending the initial on-ramp process. The larger pool will increase competition among firms “while driving down costs for the American taxpayer,” the agency said. GSA can add more companies through on-ramping at its discretion to address inadequate competition, customer requests or small businesses outgrowing that size designation. 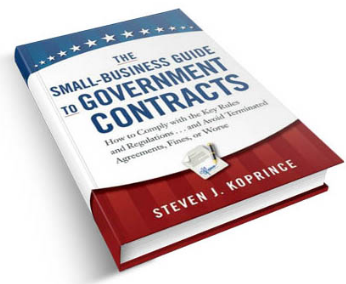 It is no secret that government construction contracts are big business for contractors. Public construction spending recorded a seasonally adjusted average of $266 billion in July 2017, and industry giants like AECOM have business units dedicated to the practice. Included among the lump sum, design-build and cost-plus contracts — to name a few — commonly used to carry out this work is another type of arrangement: indefinite delivery/indefinite quantity (IDIQ) contracting. 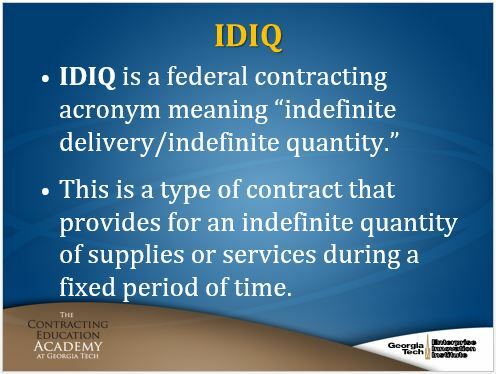 Many public agencies use IDIQ when there is uncertainty as to how much of a service they need and when they’ll need it. The word “indefinite” might lead some to think its use could cause unscrupulous contractors to abuse the mechanism as an open faucet of funding. In practice, however, it is actually a tool for governments to better manage their budgets and prevent that scenario. 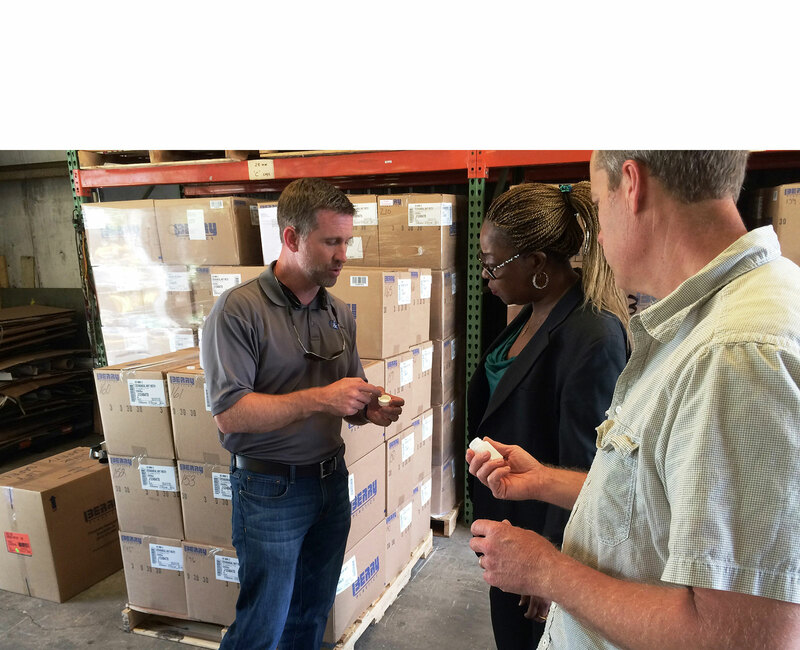 IDIQ programs allow public agencies to lock in prices for a set period of time. For contractors chosen to participate, it can be an opportunity to lock in a customer. 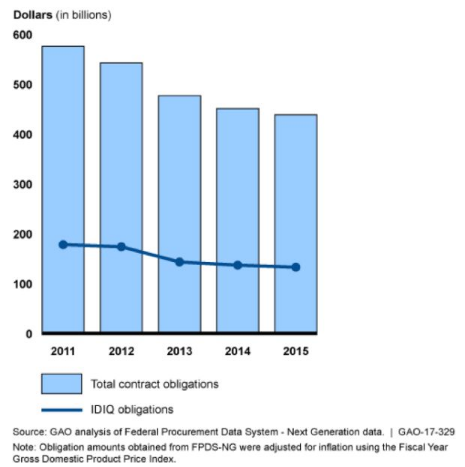 Over the past five years, the federal government has committed to spending as much as $130 billion a year on supplies and services through unusual contracts that break the mold of traditional contracting practices. Typically, when federal agencies buy anything from jetfighters to computer services to paper clips, they throw open bidding on major contracts to a number of eager businesses that compete to offer the best price, the most experience and the promise of meeting a deadline. Larger projects — like building a battle ships — are broken into scores of subcontracts that are bid out in similar fashion. Yet another type of contract, known as “indefinite delivery/indefinite quantity,” has become common at the Departments of Defense, Homeland Security, Health and Human Services and Veterans Affairs over the last decade or so, according to a new report by the General Accounting Office (GAO), with the Pentagon accounting for about 68 percent of all such contracts between 2011 and 2015. For these so-called IDIQs, the government hand picks one or more contractors to commit to delivering products and services in the future and sets a ceiling on how much money will be spent overall. Awards are for a specified number of years with renewal options, but usually for no longer than five years. The 2017 National Defense Authorization Act (NDAA), signed into law on Dec. 23, 2016, contains at least 16 changes to federal procurement policy, many directly affecting the interests of small businesses. SDVOSB Programs: 2017 NDAA Sharply Curtails VA’s Authority. (Dec. 5, 2016). 2017 NDAA Restricts DoD’s Use of LPTA Procedures. (Dec. 7, 2016). 2017 NDAA Extends SBIR & STTR Programs For Five Years. (Dec. 8, 2016). 2017 NDAA Authorizes $250 Million For New Small Business Prototyping Program. (Dec. 8, 2016). 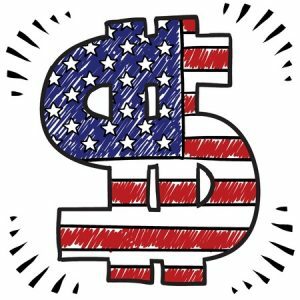 2017 NDAA Increases DoD’s Micro-Purchase Threshold To $5,000. (Dec. 9, 2016). SDVOSB Programs: 2017 NDAA Modifies Ownership & Control Criteria. (Dec. 12, 2016). 2017 NDAA Strengthens Subcontracting Plan Enforcement. (Dec. 13, 2016). 2017 NDAA Requires GAO Report On Minority And WOSB Contract Awards. (Dec. 13, 2016). 2017 NDAA Requires Report On Bid Protest Impact At DoD. (Dec. 14, 2016). 2017 NDAA Restores GAO’s Task Order Jurisdiction – But Ups DoD Threshold. (Dec. 14, 2016). 2017 NDAA Requires “Brand Name Or Equivalent” Justifications. (Dec. 19, 2016). 2017 NDAA Establishes Preference For DoD Fixed-Price Contracts. (Dec. 21, 2016). 2017 NDAA Creates Pilot Program For Subcontractors To Receive Past Performance Ratings. (Dec. 21, 2016). 2017 NDAA Reiterates GAO Bid Protest Reporting Requirements. (Dec. 30, 2016). 2017 NDAA Requires Report on Indefinite Delivery Contracts. (Jan. 4, 2017). Cost/Price Evaluation To Be Discretionary For Some DoD IDIQs. (Jan. 6, 2017). An offeror’s failure to provide the type of past performance information mandated by a solicitation led to the offeror’s elimination from consideration for a major GSA contract. A recent GAO bid protest decision highlights the importance of fully reading and adhering to a solicitation’s requirements–including those involving the type of past performance or experience information required. GAO’s decision in Dougherty & Associates, Inc., B-413155.9 (Sept. 1, 2016) involved the GSA “HCaTS” solicitation, which contemplated the award of multiple IDIQ contracts to provide Human Capital and Training Solutions across the federal government. The solicitation was divided into two Pools based on the offeror’s small business size status. The GSA established a target of 40 awards for each Pool. By now the entire government contracting community is well aware that one of the most significant changes in Federal Supply Schedule (FSS) contracting in years occurred just a few weeks ago, as the General Services Administration (GSA) issued its Final Rule on transactional data reporting. The Final Rule amends the GSA Federal Acquisition Regulation supplement (GSAR) to require FSS contractors and others with certain GSA Government-wide Acquisition Contracts (GWACs), and Government-wide Indefinite-Delivery, Indefinite-Quantity (IDIQ) contracts to report transactional data related to orders placed under those contracts. As indicated over a year ago in a prior client alert, both the contracting community and the GSA Office of Inspector General had concerns with the draft transactional data reporting rule. GSA has addressed some, but not all, of these concerns.